https://old-lekar.com ветеринарный форум чем лечить некроз. Luther Vandross (born Luther Ronzoni Vandross Jr.) (April 20, 1951 - July 1, 2005) was an African-American R&B singer. During his career, Vandross sold 25 million albums and won eight Grammy awards including Best Male R&B Vocal Performance four times. He won four Grammy awards in 2004 including the Grammy Award for Song of the Year for the track "Dance With My Father", co-written with Richard Marx. Early life and career 1951-1980. Born on the Lower East Side of Manhattan in New York City, Vandross grew up in a musical family that moved to the Bronx when he was 13. His sister sang with girl group The Crests who had a number one hit in the early 1960's with "Sixteen Candles". Vandross' father died of diabetes when Vandross was eight years old. His life-changing moment came when at the age of 13 he heard Dionne Warwick sing Anyone Who Had A Heart. It was then and there he knew he wanted to be a singer. Vandross formed a vocal group in high school which once played at the Apollo Theatre in Harlem. His first recording credit was as producer of the album Soul Christmas in 1968 and appeared as a vocalist on a Quincy Jones album Best in 1969. He was also a member of a theater workshop at the time and appeared on the first episode of Sesame Street in October 1969. His next recording credit was on an album by Roberta Flack in 1972. Vandross wrote "Everybody Rejoice" for the 1972 show The Wiz. However, Vandross had dropped out of the music scene when a friend from theater workshop invited him to sing in David Bowie's soul-influenced Diamond Dogs tour and appear as the opening act with the Mike Garson Band in 1974. He ended up singing background vocals on Bowie's album Young Americans. Vandross also sang backing vocals for Roberta Flack, Carly Simon, Chaka Khan, Bette Midler, Chic, and Barbra Streisand. During the beginning of his career, Vandross was content to remain mostly in the background, as a producer and backup singer for other artists. Roberta Flack decided to push Vandross into starting his own career because she believed that he was an incredible talent who deserved to be heard for his singing in addition to his songwriting and production. Before his breakthrough, he released two albums on Cotillion Records, the self-titled "Luther" in 1976 and "This Close to You" in 1977. He also wrote and sang commercials jingles during the late 1970s & early '80s earning upwards of $600,000 per year around the New York area. Well known advertising campaigns he wrote and/or sang jingles for include Kentucky Fried Chicken's "We Do Chicken Right" NBC's "Proud As A Peacock" & The US Army's "Be All You Can Be". Vandross continued his successful career as a popular session singer during the late 70's. His lead vocals can be heard on the Gregg Diamond produced single "Hot Butterfly" from Bionic Boogie in 1978 which gained moderate nightclub success. He eventually made his breakthrough as a guest singer with the group Change. Their 1980 hits, "The Glow of Love" and "Searching" led to a recording contract with Epic Records, and in 1981, he made his solo recording debut with the LP "Never Too Much". The album, which contained the track "A House is Not a Home" went double platinum, with the song "Never Too Much" reaching #1 on the R&B charts. Vandross released a series of million-selling albums during the 1980s and continued his session work with guest vocals on groups like Charme in 1982. Although the albums were very successful overall, many of his earlier albums made a much bigger impact on the R&B charts. Vandross had more modest success on the pop charts during this time. During the 1980s, Vandross had two other singles that reached #1 on the R&B charts: "Stop to Love" in 1986 and a duet with Gregory Hines "There's Nothing Better Than Love". He also sang duets with Dionne Warwick and Cheryl Lynn. He was also in demand as a producer; he was at the helm for Aretha Franklin's albums "Jump To It" and "Get It Right". (Franklin saw some moderate commercial success with those Vandross-produced tracks after a long chart absence.). The 1989 compilation of greatest hits, The Best Of Luther Vandross.The Best Of Love, included the ballad "Here And Now", the first Vandross single to chart in the Billboard pop chart Top Ten. He also won his first award for Best Male R&B Vocal Performance in the Grammy Awards of 1991. Vandross hit the top ten again in 1994 with "Endless Love", a duet with Mariah Carey and a cover of Lionel Richie and Diana Ross's hit song from the film Endless Love. He also sang a duet with Frank Sinatra on Sinatra's Duets album. In the Grammy Awards of 1997, he won his third Best Male R&B Vocal for the track "Your Secret Love". A second greatest hits album, released in 1997, compiled most of his 1990s hits and was his final record released through Epic Records. After recording "I Know" on Virgin Records, he signed with J Records. In 2003, Vandross released the album Dance With My Father in memory of his father. The title track, which was dedicated to the memory of the younger Vandross' childhood dances with his father, won Luther and his co-writer, singer Richard Marx, the 2004 Grammy Award for Song Of The Year. The song also won Vandross his fourth and final award in the Best Male R&B Vocal Performance category. The album was also the first album by Vandross to reach #1 on the Billboard album chart. Vandross had diabetes, a disease that ran in his family, as well as hypertension. His weight fluctuated several times over the years, and Vandross had weighed over 300 pounds (136 kg) at his heaviest. His father, Luther Sr., died of complications from diabetes when Luther Jr. was eight years old. Luther Jr.'s two sisters and a brother also predeceased him. 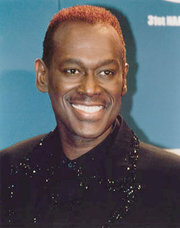 On April 16, 2003, Vandross suffered a stroke in his home in Manhattan. (Although the cause of Vandross' stroke was not specifically attributed to diabetes, diabetics have been identified as being much more susceptible to strokes.) Although he appeared briefly on videotape at the 2004 Grammys to accept his Song of the Year award, he was never seen in public again. Vandross died on July 1, 2005 at John F. Kennedy Medical Center in Edison, New Jersey. He was 54. At this time, the cause of death is not known, although hospital spokesperson Rob Cavanaugh has said that Vandross never recovered from the 2003 stroke. It was reported that he died peacefully, surrounded by his family and friends. The Rev. Jesse Jackson, a friend of Vandross, described him as "a boy so mellow, so powerful; a boy of rare, rare vintage. We lost Luther very early because of his medical condition, but his legacy will be a powerful legacy". His funeral was in New York on July 8, 2005. After two days of viewing, Vandross was buried in George Washington Memorial Park in Paramus, New Jersey.